The US spends over $218 billion, or 1.3 percent of GDP, growing, processing, transporting, and disposing of food that is never eaten, according to a new report. That translates to around 63 million tons of food waste, which is 40 percent of all food grown, including food that’s left unharvested on farms. Producing this food that’s destined for waste uses 18 percent of the country’s cropland. That’s 80 million acres, or three-quarters the size of California. It also involves 19 percent of fertilizers, 21 percent of fresh water, and 21 percent of landfill volume in the country, according to the report from ReFED, a collaboration instigated by the Fink Family Foundation involving 30 high profile business, nonprofit, foundation, and government leaders. But there’s hope. Food waste can be reduced by 20 percent in 10 years, and 50 percent by 2030, according to ReFED’s report — “Rethinking Food Waste through Economics and Data: A Roadmap to Reduce Food Waste”. 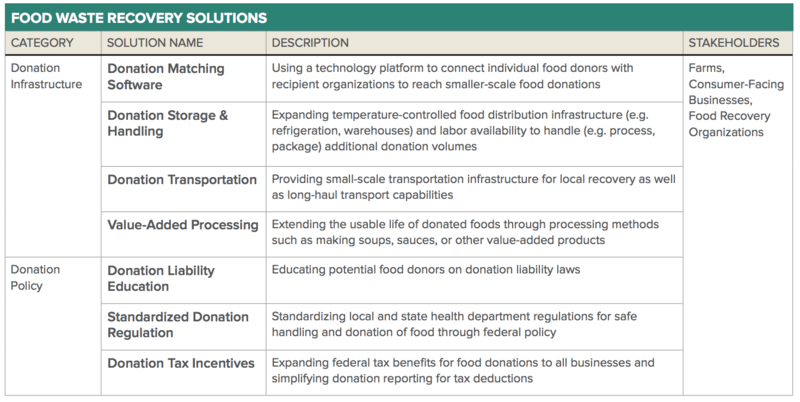 To reach this goal, ReFED has drawn up 27 solutions requiring action by 11 different stakeholders: consumers, entrepreneurs, farmers, governments, foundations, investors, manufacturers, non-profits, restaurants, grocery chains, and academia. The consumer is key, according to Adam Rein, a report contributor from MissionPoint Partners, the project lead and an impact investment firm. That’s because nearly 85 percent of food waste happens in homes or at consumer-facing businesses like restaurants and grocery stores. The report calls for $18 billion in spending to reach a 20 percent reduction in 10 years. “That’s a large number, so it’s important to see it in context,” said Rein on the webinar. In return for this investment, the report estimates $100 billion in net societal economic value. Every year 1.8 billion meals will be recovered, 1.6 trillion gallons of water saved, $2 billion in business profits, $6 billion in consumer savings, 18 million tons of greenhouse gas emissions reduced, and 15,000 jobs created. With just $90.6 million invested in waste tech startups last year, according to AgFunder’s AgTech investing report, there’s plenty of opportunity for entrepreneurs and investors to help reach these goals. And ReFED has mapped out the opportunity to tap a $2 billion market in the report. Spoilage prevention packaging and labeling, IT-enabled transportation and storage, logistics software, value-added compost products, distributed recycling solutions, anaerobic digestion technology. 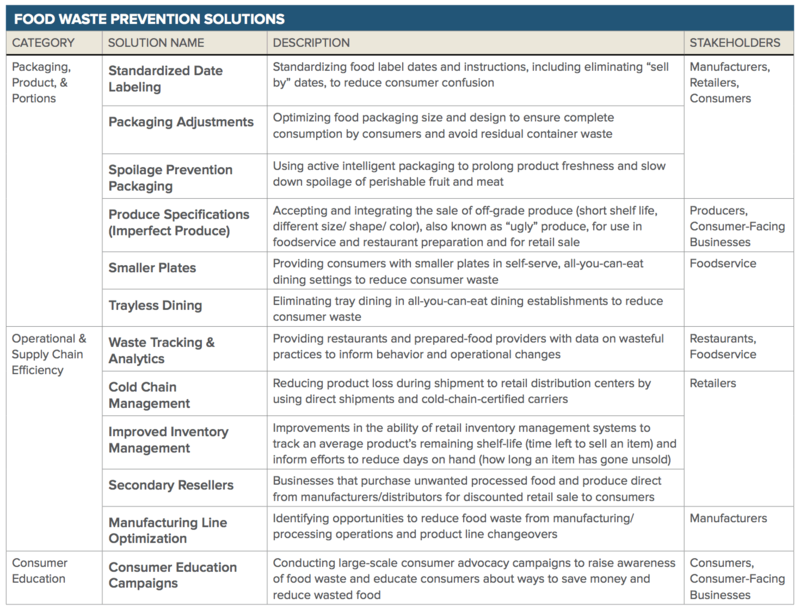 Business model innovation to develop new models to share risk and rewards for food waste reductions across the supply chain to overcome split incentives. Flexible project finance for Centralized Compost and Centralized anaerobic digestion facilities. Early-stage and growth equity to scale existing business software solutions and innovative technologies that reduce the cost of prevention, recovery, and recycling. 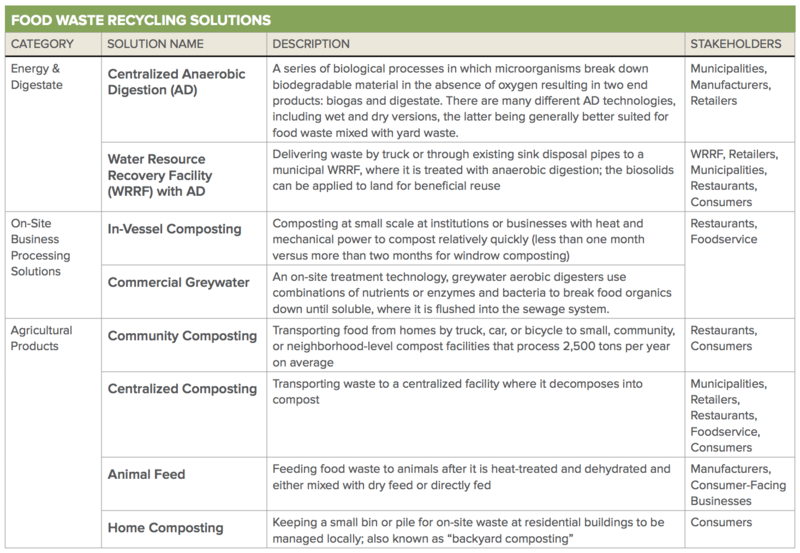 Here are the 27 solutions identified by ReFED to reduce waste by 13.2 million tons. They break into three categories: prevention, recovery or re-distribution, and recycling or repurposing.